Quick Study: Pavel Basinsky is a journalist, literary critic and scholar, and fiction writer who won wide notice with a book about Leo Tolstoy. The Basinsky File: Journalist, critic, and fiction writer Pavel Basinsky hit the bestseller list and won the 2010 Big Book Award with Leo Tolstoy: Flight from Paradise, a nonfiction account of Tolstoy’s life that begins with the end by investigating the writer’s departure from his home. Flight from Paradise was also named Book of the Year at the Moscow Book Fair in 2010, the hundredth anniversary of Tolstoy’s death. Basinsky first made the Big Book shortlist in 2008 with his debut novel, A Russian Novel, Or the Life and Adventures of John Polovinkin, a novelistic study in genres. He has been on the judges’ panel for the Debut, Solzhenitsyn and Yasnaya Polyana prizes, and has been writing cultural and literary criticism for a half-dozen newspapers and journals since 1981. Along with being a Tolstoy expert, he has also written three books on Maxim Gorky and compiled anthologies of individual writers such as Gorky, Mandelstam, Leonid Andreyev, and Mikhail Kuzmin, as well as anthologies of poetry and prose. Basinsky’s Places: Born in Frolovo, a small city in the Volgograd region. Attended Saratov University and Moscow’s Gorky Literary Institute, where he studied criticism and received a PhD in comp lit. Has written about Yasnaya Polyana, where Leo Tolstoy lived. The Word on Basinsky: A Russian Newspaper article on Basinsky winning 2010 Book of the Year quotes Vladimir Tolstoy of the Yasnaya Polyana Museum saying Flight from Paradise is “very delicate, and precise on the facts.” Writer and critic Dmitry Bykov says in the article that there is certainly no more humane book about Tolstoy. 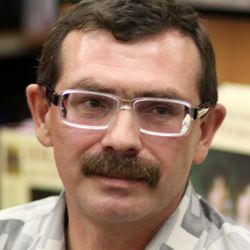 Basinsky on Basinsky: After winning the Big Book Award, Basinsky was quoted in First Newspaper in Volgograd as saying he visits Yasnaya Polyana regularly and feels there as if he’s in “another dimension,” sensing the world and himself differently. That led him to wonder why Tolstoy would want to leave. Basinsky Recommends: Basinsky wrote his dissertation about Maxim Gorky and Friedrich Nietzsche. He has compiled books with works by such poets and prose writers as Gorky, Leonid Andreev, Osip Mandel’shtam, and Mikhail Kuzmin. Basinsky’s Places: Born in Frolovo, a small city in the Volgograd region. Attended Saratov University and Moscow’s Gorky Literary Institute, where he studied criticism and received a PhD in comp lit. Has written extensively about Yasnaya Polyana, where Leo Tolstoy lived. Leo Tolstoy: Flight from Paradise – winner, Big Book Award, 2010; named Book of the Year at the 2010 Moscow Book Fair.